In July 2015, or two years ago, OneUnited Bank unveiled the revolutionary 550 square foot mural Thunder & Enlightening on the façade of our historic Miami branch. The emotionally charged work of art by internationally celebrated, Miami based muralist Addonis Parker, illustrates the events and issues facing the Black community including racism, bigotry, violence, protest, the massacre in South Carolina, Trayvon Martin, Michael Brown and first responders. As the largest Black owned bank in America, OneUnited Bank undertook this historic and, quite frankly, risky project to bridge the divide between the banking industry and the Black community. We hoped that illustrating the realities of urban communities on a federally insured institution would open minds to the potential for banks and the Black community to work together in new and different ways. 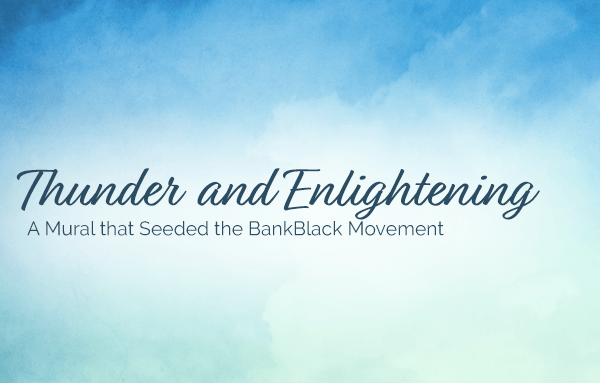 The “seed” planted by the mural has bloomed into a national movement – the #BankBlack and #BuyBlack movement. The Black community is not only moving their money to Black owned banks, but also “moving their minds” to better support Black owned businesses. For example, many senior citizens have walked into our branches and stated it was the first time they had ever been in a bank. Previously, they did not feel welcomed. Many customers have stated that for the first time in their lives, they are excited about banking. The conversations on social media have included financial literacy and discussions that directly confront the discredited adage that “their ice is colder” or the incorrect belief that Black businesses are inherently “less than.” The Black community is now focused on collective economics and community wealth building in unprecedented ways. They are taking the BankBlack Challenge! In 2017, the BankBlack Movement is stronger than ever with over $50 million in deposits moved to Black owned banks in just 12 months. OneUnited Bank is also evolving. We launched an online second chance checking program for people with ChexSystems records, which is one of our most popular services. We expanded our Contact Center and social media teams, upgraded vendors and increased our staff by 10% to better serve our customers. We expanded our annual “I Got Bank” financial literacy contest for youth to include essays and art and increased the selection of winners from 3 to 10. We also expanded our loan capacity through our secured credit card program, to help rebuild credit, and through home loans to expand homeownership with partnerships with first time homebuyers programs in Boston, Miami and Los Angeles. We also developed our partnerships with BankBlack USA, BMe Community, the African American Film Critics Association (AAFCA), BLACKOUT Coalition and others to support the #BankBlack and #BuyBlack movement and support financial literacy. We know that this is more than a moment, it’s a movement! Let’s take this journey together. To learn more about the mural, Thunder & Enlightening, and the 2015 OneUnited Mural Project, an apprenticeship-based program, in partnership with Miami Children’s Initiative, using public art works, youth development and a community beautification program providing arts enrichment through STEAM (Science, Technology, Engineering, Arts, Math) education, click here. This is interesting. I have personal and savings, but I also need a business account. It has been brought to my attention that you have to be present at an institute in order to open this type of account. This does not help the small businesses really wanting to do business with one united. When will online availability come to fruition? Great job I want to do my part by opening a account to help the Dream. I am with you and I would love to join a brainstorming session to present other ideas for getting the unbanked banked at One United! I am with the efforts of One United! love my black bank,the workers are family, they lovingly take care of our needs for our black cultures. This is gorgeous, maybe this could be part of the images on our debit cards one day. It would be awesome if all of the black banks across the country could form a coalition network together to help strengthen the black dollar. How does a person open an account online when they require a deposit from a traditional, transactional bank account? This makes no sense to me being that you only have a few brick and mortar branches. As a person who does not have a bank account, but desires to join the #bankblack movement, you all seem to make it just as difficult as white owned/controlled banks. I know plenty of other Black men similarly situated. For example, I/we would like to get an online account, but it using PayPal to put money in the account is not allowed. Does your organization have any suggestions or plans to address such an issue? Hi Kirk. You can also use a prepaid debit/credit card to open an account with us online. I am a proud senior member of One United Bank Los Angeles. I am continuing to spread the word to younger people to BANK BLACK. Make your way to Crenshaw Blvd and open your account. NOW! As an online/internet bank do you have debit card atm fee refunds for members transactions? Hi Onyango. We offer access to over 25,000 ATMs across the nation, surcharge-free!